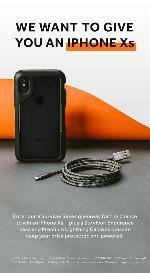 This contest has been marked as a duplicate of == Win an iPhone XS + a Survivor Endurance Case + a Premium Lightning Cable ($1,080)! ==. Prize: One (1) Prizesshall consist of: (1)Apple iPhone XS Space Grey 64GB, (1)Griffin Survivor Endurance Phone Case and (1) Griffin Premium 10ft Lightning Cable. Statistics: This contest was opened by 6 and entered by 2 ContestChest.com members. 33% of those who opened the contest, entered it.